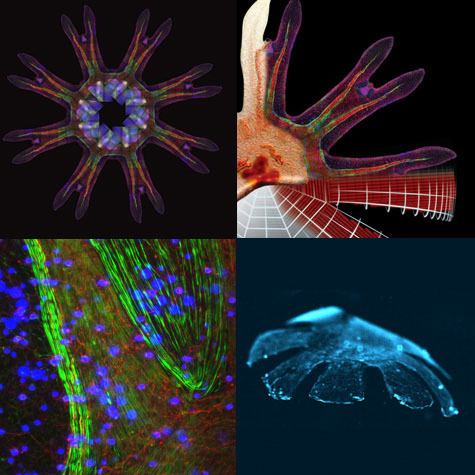 Top left: A single jellyfish lappet, or appendage, was multiplied and rotated to form an eight-armed mosaic image suggesting the muscle geometry (shown in green.) Right: An illustration shows the different stages of analyzing a juvenile jellyfish in order to design and build a tissue-engineered jellyfish. Bottom left: Image of swimming muscle at junction between lappet and main body in a juvenile jellyfish. Right: Colorized image of the tissue-engineered jellyfish in ocean-like saltwater. After thoroughly studying jellyfish propulsion, including the arrangement of their muscles, how their bodies contract and recoil, and how fluid-dynamic effects help or hinder their movements, a team of scientists tissue-engineered a jellyfish with biomimetic propulsion from chemically dissociated rat tissue and silicone polymer. Their method for building the tissue-engineered jellyfish, dubbed Medusoid, is outlined in a Nature Biotechnology paper that appears as an advance online publication on July 22. Jellyfish are believed to be the oldest multi-organ animals in the world, possibly existing on Earth for the past 500 million years. Because they use a muscle to pump their way through the water, their function—on a very basic level—is similar to that of a human heart, which makes the animal a good biological system to analyze for use in tissue engineering. Parker contacted John Dabiri, professor of aeronautics and bioengineering at Caltech—and Nawroth’s advisor—and a partnership was born. Together, the two groups worked for years to understand the key factors that contribute to jellyfish propulsion, including the arrangement of their muscles, how their bodies contract and recoil, and how fluid-dynamic effects help or hinder their movements. Once these functions were well understood, the researchers began to design the artificial jellyfish. Nawroth and colleagues looked at several materials from which to fashion the body of their beast, eventually settling on an elastic material that is relatively similar to the “jelly” found in a real jellyfish. The team at Harvard—with the help of Nawroth, who spent time on both campuses during the length of the project—fashioned the silicone polymer that makes up the body of the Medusoid into a thin membrane that resembles a small jellyfish, with eight arm-like appendages. Next, they printed a pattern made of protein onto the membrane that resembled the muscle architecture in the real animal. The protein pattern serves as a road map for growth and organization of dissociated rat tissue—individual heart muscle cells that retain the ability to contract—into a coherent swimming muscle. When the researchers set their creation free in an electrically conducting container of fluid and oscillated the voltage from zero volts to five, they shocked the Medusoid into swimming with synchronized contractions that mimic those of real jellyfish. In fact, the muscle cells started to contract a bit on their own even before the electrical current was applied. This advance in bio-inspired engineering, the team says, demonstrates that it is inadequate to simply mimic nature: the focus must be on function. Their design strategy, they say, will be broadly applicable to the reverse engineering of muscular organs in humans. In addition, Dabiri and colleagues say, their new process of harvesting heart-muscle cells from one organism and reorganizing them in an artificial system will be useful in building an engineered system using biological materials. The team’s next goal is to design a completely self-contained system that is able to sense and actuate on its own using internal signals, as human hearts do. Nawroth and Dabiri would also like for the Medusoid to be able to go out and gather food on its own. Then, researchers could think about systems that could live in the human body for years at a time without having to worry about batteries because the system would be able to fend for itself. For example, these systems could be the basis for a pacemaker made with biological elements. Other Harvard collaborators who contributed to the Nature Biotechnology paper, “A Tissue-Engineered Jellyfish with Biomimetic Propulsion,” are Hyungsuk Lee, Adam W. Feinberg, Crystal M. Ripplinger, Megan L. McCain, and Anna Grosberg, who earned her PhD in bioengineering at Caltech. Funding for the study included grants from the Wyss Institute for Biologically Inspired Engineering at Harvard, the National Science Foundation (NSF), the National Institutes of Health, the Office of Naval Research, and NSF Program in Fluid Dynamics. Be the first to comment on "Medusoid, A Tissue-Engineered Jellyfish with the Ability to Swim"